Yeehaw! It is time to get ready for the big event. I haven’t planned a thing so I hope the rest of you are ahead of me. As the big bird day approaches, remember you can buy the entire meal at Whole Foods and heat it up or go out to dinner. You don’t have to cook it unless you love it and have the energy. My husband does most of the work so I ask him every year if he wants to go out. He is shocked by the suggestion. He loves cooking up a storm (I just wish we could hire someone else to clean up the storm). On a side note, this year I noticed certain stores will be open on Thanksgiving to get a jump on Black Friday. I, for one, will have had too much wine to drive to my Best Buy at 5 PM so I am skipping the door busters. Here is a list of stores that are refusing to open: Stores Staying Closed on Thanksgiving Day. I have worked retail during the holiday season and it is not easy. Thank you, kind retail stores, for giving employees the day off to be with their families! The Calorie Control Council says that the average American will consume 4,500 calories on Thanksgiving Day alone so it might be a good idea to try some lighter options. There is a delicious “Almost Cream of Mushroom Soup” and in my book that would be a wonderful starter – only 167 calories for 2 cups and you might eat less of the heavy stuff if you have some healthy soup. I also include a healthier mashed potatoes recipe. Please share your favorite Thanksgiving tip or recipe. I so agree with you. I too will not be shopping on Thanksgiving. I am cooking and hosting and the last thing I would be thinking of is going shopping. By the end of the day I am exhausted. I barely sit down and I am already falling a sleep while trying to look at all the ads. I actively avoid stores that are open on Thanksgiving, not just then but for the entire holiday season. Thanks for the link to the list. What recipe is pictured? Looks good! 4500 calories on Thanksgiving Day! !~ OMG.. thanks for the lighter suggestions. I think it is probably a good idea to start with a plan for the big day or otherwise it could be a big disappointment the next morning. Good tips! 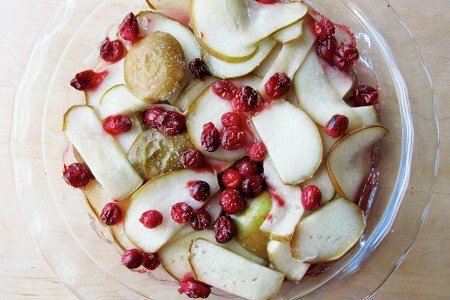 @Shari - that is the "New Lighter Thanksgiving Pie"- pears and cranberry and no crust. Try it!